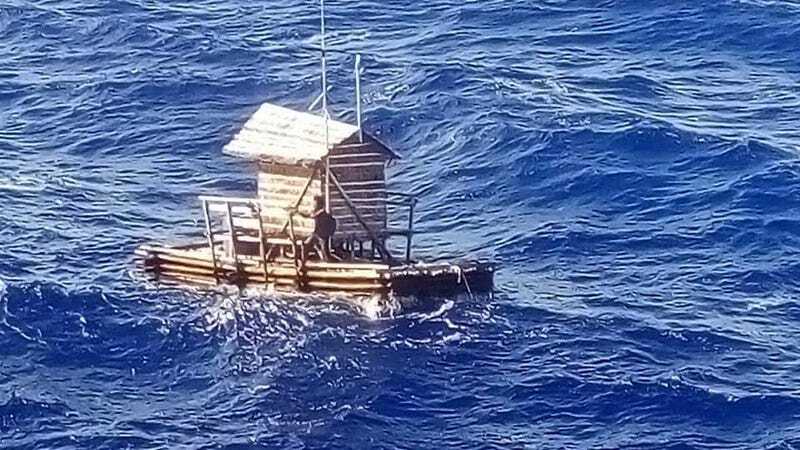 An Indonesian teenager is safe after spending more than a month and a half at sea in a floating fishing hut, The Jakarta Post reports. Aldi Novel Adilang, 19, was in charge of lighting the lamps on a fish trap that used light to attract fish, according to a Facebook post from the Indonesian consulate in Osaka, which oversaw Aldi’s rescue. The contraption, known as a rompong, was about 75 miles away from the coast. Aldi tended it alone, but was visited once a week by someone who would take the captured fish and provide food and supplies, according to the Post, which spoke with consular officials. Aldi stayed in a small vessel that was anchored by a long rope. But in July, strong winds pummeled the hut and the rope snapped, and Aldi floated deeper into the Pacific Ocean. The teenager ran through most his supplies within a few days, but he caught fish and cooked them by burning wood from his vessel, and he sucked water off his clothes, which filtered out some of the salt, according to The Guardian. He also crafted a shower out of bamboo. Aldi told local news outlet TribunManado that he thought he was going to die and contemplated drowning himself at times. But he found comfort in his faith, often praying and and reading his Bible. On August 31st, Aldi saw the bulk freighter that would save him. But when he waved his clothes trying to get the crew’s attention, no one saw him, according to the Post. Aldi then reportedly used a radio to signal the ship, and caught the captain’s attention. The ship had to circle Aldi multiple times before finally getting close enough to pull him in. The crew provided Aldi with food, clothes, and a haircut, the Post reports. The freighter took Aldi to Japan where the consulate officials arranged his return home. He flew home to Manado earlier this month. Aldi told TribunManado he would not work at sea anymore, and would work instead on land.